Kosovo is administratively subdivided into seven districts (Albanian: Rajone; Serbian: Окрузи, Okruzi). They are further subdivided into 38 municipalities (Albanian: Komuna, Serbian: Oпштина or Opština). 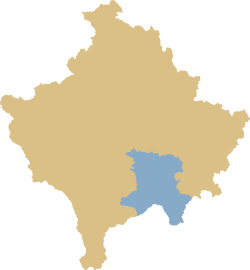 Under the United Nations Interim Administration Mission in Kosovo (UNMIK), established in 1999, new districts were formed in 2000.
on the territory of the Kosovska Mitrovica District it made new District of Mitrovica. it transferred the municipality of Orahovac to the District of Gjakova. it split the Kosovo District in two – the new District of Pristina and District of Ferizaj. it renamed the Kosovo-Pomoravlje District as the District of Gjilan. it transferred the municipality of Novo Brdo to the District of Pristina. it formed new municipality Mališevo by taking territories from the municipalities of Orahovac (Prizren District/District of Gjakova), Suva Reka (District of Prizren), Klina (District of Peć) and Glogovac (Kosovo District/District of Pristina). it transferred the bigger part of Orahovac municipality that is outside of the new municipality of Mališevo to the District of Gjakova. 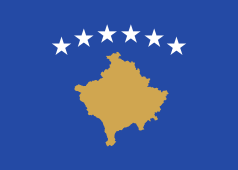 Serbia protested about the new territorial division and does not see it as legitimate, but by the United Nations Mission in Kosovo administration implemented it regardless of Serbia's protests, because it has such authority established by virtue of the United Nations Security Council Resolution 1244. ↑ "Komunat në rajonin e Ferizajt". ↑ "Komunat në rajonin e Gjakovës". ↑ "Komunat në rajonin e Gjilanit". ↑ "Komunat në rajonin e Mitrovicës". ↑ "Komunat në rajonin e Pejës". ↑ "Komunat e Kosovës: Rajoni Kosovë". ↑ "Komunat në rajonin e Prizrenit".